Explore, bike, sightsee, wander, eat and sip - the Southern Lakes region will mellow you out in no time. Tucked away in the hills, Arrowtown is a charming historic village that deserves at least half a day of your time. The town is steeped in stories of riches and rough living, because it was established in heady days of the Otago gold rush. Wander the pretty streets of historic homes, which are shaded by huge sycamore, ash, oak, elm and rowan trees. In autumn, the colours are spectacular. Arrowtown has more than 30 excellent eateries, so time your visit accordingly. From Thai and Indian to gourmet burger joints and gastro pubs, there's something for every appetite here. Before you depart this charming village, visit the Lakes District Museum - it's an award-winner that will open your eyes to the hard lives of the early settlers. The lake was carved by glaciers 15,000 years ago and has a mysterious fall and rise, explained by Maori legend as the beating of a giant's heart. By night, Queenstown hums with music, talk and laughter. If you want to escape the hubbub, catch the Skyline Gondola up Bob's Peak for an hour of star gazing. Top-of-the-line telescopes bring you closer to the Southern Cross, Milky Way and the moon. There's nothing like a night of nebula-watching to put things in perspective. There's a great restaurant up here too, but you should book ahead because it's very popular. 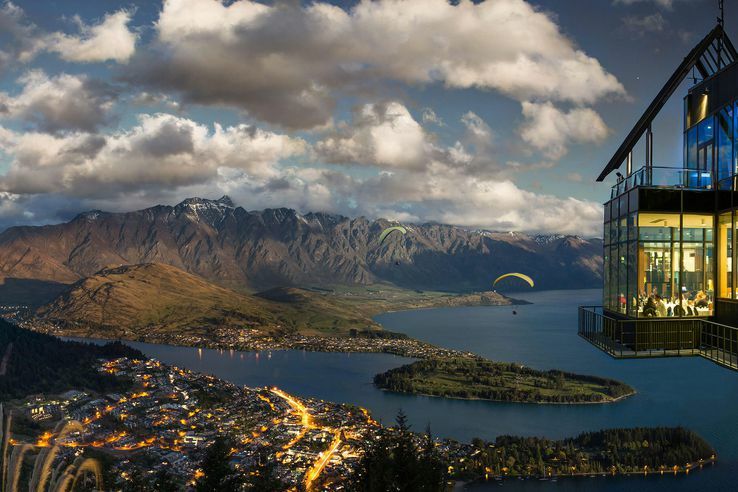 If you get a window seat, the night-time views over Queenstown and the lake are extraordinary. At the Skyline complex there's also the option to watch a haka show, which runs four times a night. Watched over by The Remarkables, which are truly remarkable, Lake Wakatipu is New Zealand's longest lake. It was carved by glaciers about 15,000 years ago and has a mysterious fall and rise (12cm every five minutes), explained by Maori legend as the beating of a giant's heart. The cruisiest way to explore the lake is on TSS Earnslaw, a century-old steamship that plies the waters between Queenstown and Walter Peak High Country Farm. When you reach the farm, options include a guided farm tour, horse trek, barbecue lunch or country-style dinner. During the voyage there and back, an onboard pianist plays sing-alongs. It's a charming experience.